Bartosz is a computer professional focused on software engineering with a solid background in IT industry. He gained his experience by being involved in multiple, both commercial and research, projects in various roles, including systems administrator, software engineer, IT consultant and a team leader. 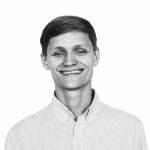 Bartosz's research interests focus on, in particular, component-oriented software engineering, continuous automation, and virtualization. Currently, he is a Senior Software Engineer and a Trainer at Luxoft Poland.